The Shuttle driver will go through everything you need to know including the pick up times for the day, much of this is safety related so please pay attention. This rate applies to all guests and campers or bookings made through booking channels e.g. Booking.com, Expedia, Agoda, Hostelworld etc. Be prepared for anything as the weather in the Tongariro National Park can be extremely changeable. In the summer months, you can expect temperatures from 5° C to 35° C, and in winter from about -10° C to 10° C.
The weather conditions are highly variable and impact significantly on your safety. Department of Conservation (DOC) has determined the weather criteria which all Transport Providers are advised to adhere to. Metservice weather forecast is used as the benchmark to make decisions as to whether trips should take place. 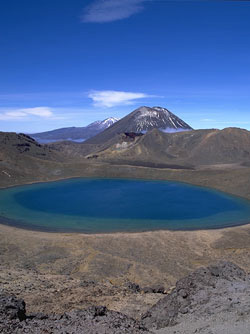 The Tongariro Alpine Crossing is described as the best one-day walk in New Zealand. This amazing 19.4km walk will take you through a fascinating lunar-lake landscape full of active volcanoes, mountain springs, craters and lava flows. The Tongariro Alpine Crossing track winds up the Mangatepopo Valley to the saddle between Mt Tongariro and Mt Nagauruhoe. It climbs to Red Crater (1886m), then drops down to the Emerald and Blue Lakes. The track then descends around the northern slope of Tongariro, meandering to the Ketetahi Hut. The full walk is moderately challenging and it will take the average person about 5-8 hours to complete depending on fitness, allowing time for photos. Taking the Tongariro Alpine Crossing is a real adventure and an experience not to be missed! The Tongariro Alpine Crossing is a real must do for anyone who enjoys beautiful scenery and a bit of a challenge. Thousands of people do it every summer. It can be done in winter too, but then it is only recommended as part of a guided group. The Crossing Backpackers has plenty of secure car parking. You are welcome to leave your vehicles here whilst you expereince the Tongariro Alpine Crossing. We recommend that you book on our daily shuttle service. 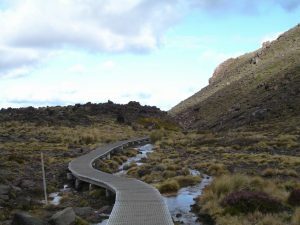 Tongariro Alpine Crossing is within the Tongariro National Park, a UNSECO Dual World Heritage Park for both natural and cultural values and the first in the world to receive associative cultural World Heritage status. Tongariro Alpine Crossing is within the role of Ngāti Tūwharetoa. Please respect the local Iwi, Ngāti Tūwharetoa and help educate visitors that the peaks and lakes are sacred. The alpine environment is a fragile ecosystem. Visitors are encouraged to keep to the track/ poled route. It is not acceptable to use nature as a toilet. Visitors are encouraged to use toilets and take their own toilet paper. In New Zealand it is offensive to defecate on or off the track and is a human health hazard. A map of toilets along the hike will be located at the start of the hike. It is illegal to fly drones or walk your dogs in the Tongariro National Park. Please leave drones and dogs at home.